Mad Mass™ 13lb Value Size! 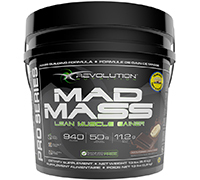 Revolution Nutrition™ Mad Mass™ is a proven weight gain formula that is a step beyond anything else available on the market! Each serving is loaded with high quality muscle building calories that will force your body to grow. One full serving of Mad Mass™ will supply your body with 50 grams of protein and the necessary amount of carbohydrates for you to reach your full potential. With a taste defying any regular milkshake, using this product will feel like eating dessert at your favorite ice cream parlor. So don't just get big - get extremely big today with Mad Mass™! Mad Mass™ has been carefully engineered using three different types of protein to get the maximum variety of amino acid profiles in each serving. To ensure protein absorption, Mad Mass™ supplies your body with 3 different sources of carbohydrates (Waxymaize, Sweet Potato Powder and Maltodextrin) for maximum muscle growth. If you train in the evening: Mix 2 scoops (1/2 a serving) in 250 ml of water in the morning, mix again 2 scoops in 250 ml of water in mid-afternoon and 4 scoops (full serving) in 500 ml of water immediately after training. You can adjust servings to meet the requirements of your training regimen.